This year’s Anzac Day commemorations at Lourdes Toowoomba attracted record numbers. To mark the 100th anniversary of the Gallipoli landings, Lourdes Home for the Aged held a special Anzac Day commemorative ceremony on Friday 24 April. Lourdes’ Diversional Therapists paid special tribute to residents who were returned service men and women by recounting their individual war efforts while the each of the residents laid a wreath at the altar. Lieutenant Colonel Steven Stockley from the Oakey Aviation Base addressed the ceremony for the third year in a row. “It was very special to see so many people attend this Anzac Day Memorial Service. I was thrilled to be able to contribute to this event again, especially on the Centenary commemoration,” Lieutenant Colonel Stockley said. He was very keen to meet up with one resident in particular. At last year’s Anzac Day service, I found myself standing next to an elderly lady in a wheelchair. She was a resident at Lourdes and had served as a Nurse during World War II. 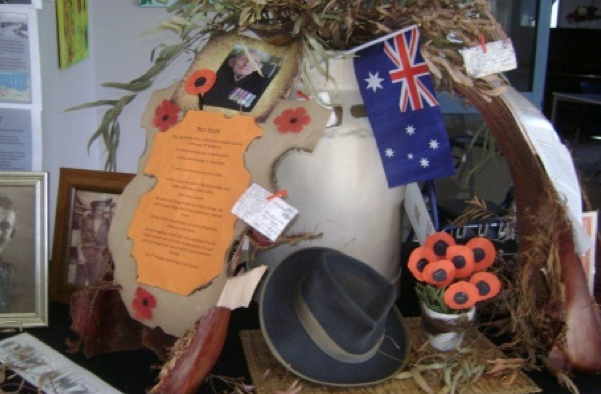 Along the corridors, staff and residents worked together to create an impressive Anzac exhibit that showed the stories of residents who had fought in World War II. Wartime photographs were proudly displayed, along with uniforms, medals, flags and other war memorabilia. Lourdes’ Facility Manager, Nancy Mathers, commented on the significance of this display. “It was a wonderful reflection of how proud everyone is of our war heroes. “We all enjoyed reading about the wartime experiences of our residents and their families,” she said. On Saturday 25th April, Lourdes Home for the Aged also conducted an Anzac Day Mass in their Chapel. A record 87 people including residents and their families, staff members, volunteers and invited guests attended this special mass conducted by their Chaplain Father Oliver Ryan.